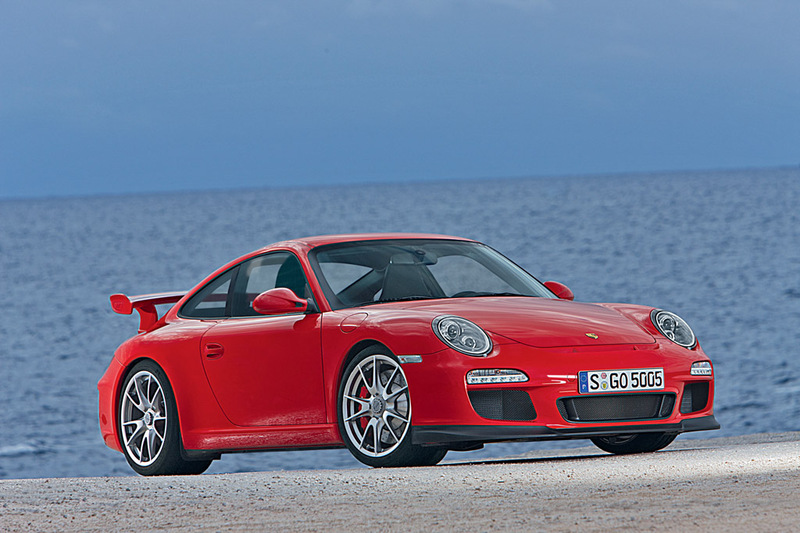 2009/01/29 – Porsche is adding yet another new model to the second generation of the 911 model series: the new GT3 even more powerful, faster, and refined than its predecessor. In developing the most sporting and dynamic road-going 911 with a normal-aspiration power unit, Porsche has applied a wide range of know-how gained in motorsport. Indeed, this is precisely why the new GT3 is truly impressive not only on the road, but also on the race track. 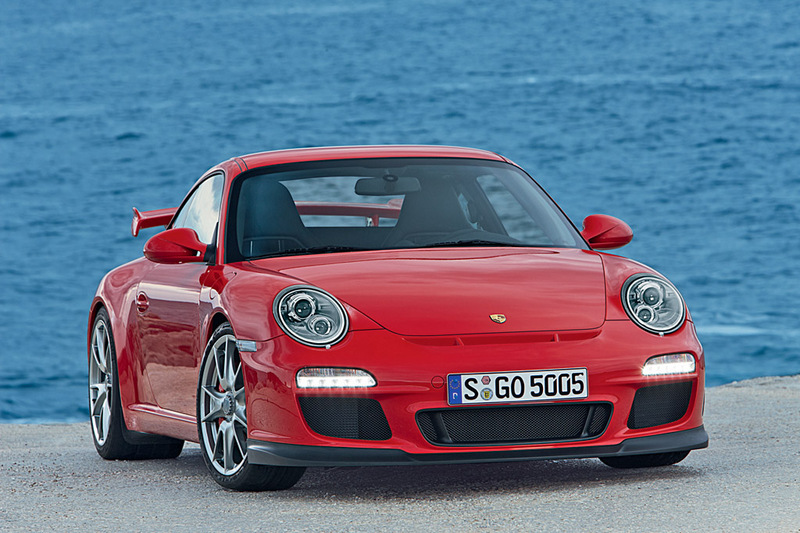 The new 911 GT3 is making its world debut at the Geneva Motor Show on 3 March, with Europe-wide sales starting in May. 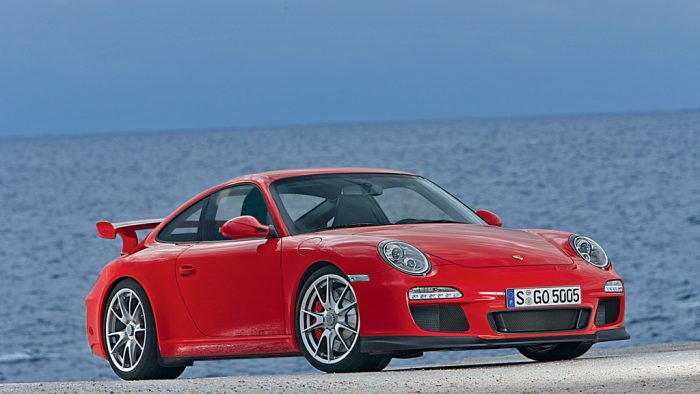 The 911 GT3 offers an even higher standard above all in two key areas: performance and driving dynamics. Now the proven six-cylinder naturally-aspirated power unit develops maximum output of 435 bhp (320 kW), up 20 bhp over its predecessor. This results first and foremost from an increase in engine capacity by 200 cc to 3.8 litres and from the improved gas cycle: now not only the intake, but for the first time also the exhaust camshafts are adjusted by VarioCam. A further important point is that, through its upgraded power and performance, the boxer engine also offers a significant increase in torque at medium engine speeds, a benefit of particular significance in everyday motoring. Clearly, this also means a further improvement in performance, the new GT3 accelerating from a standstill to 100 km/h in 4.1 seconds and reaching 160 km/h in 8.2 seconds. Top speed is 312 km/h or 194 mph. 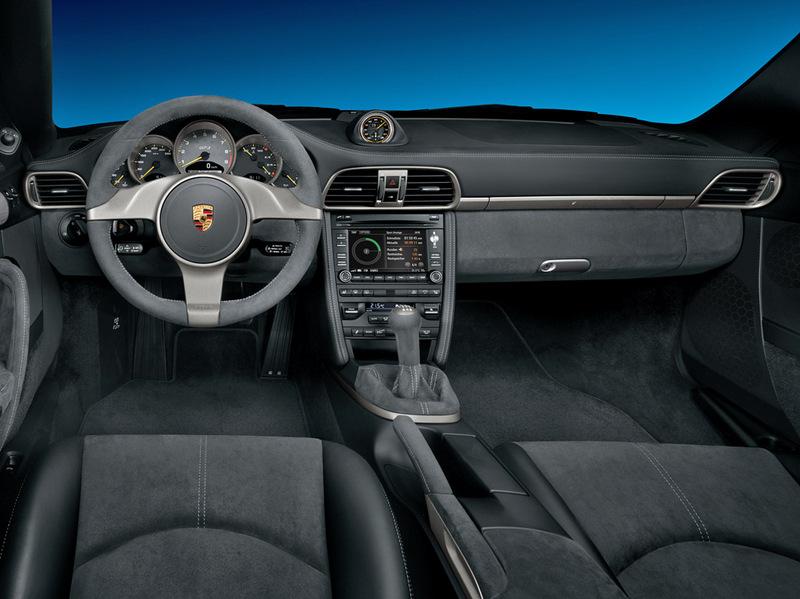 The second highlight in developing the 911 GT3 to an even higher standard was to further improve the car’s driving dynamics: For the first time the 911 GT3 comes with a particularly sporting variant of PSM Porsche Stability Management, offering the option to deactivate both Stability Control (SC) and Traction Control (TC) in separate steps. 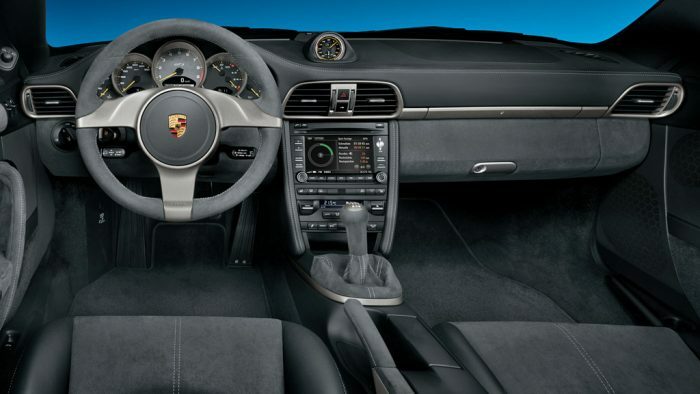 And to give the driver unrestricted, individual control over the driving dynamics of his car, these functions are not reactivated automatically even under the most extreme driving conditions, but only at the touch of a button. The new GT3 offers even better grip and stability also at high speeds, specific modifications of the car’s aerodynamics increasing down-forces both front and rear to such an extent that the overall pressure pushing down the car is more than twice as great as on the former model. At the same time the new Aerodynamics Package gives the GT3 a brand-new look further accentuated by the new bi-xenon headlights, LED rear light clusters, as well as modified air intakes and outlets. The active PASM suspension of the 911 GT3 enables Porsche’s engineers to make the springs and anti-rollbars somewhat stiffer yet again, thus ensuring even more precise handling in the PASM sports mode, while retaining appropriate roll comfort suitable for everyday use in the normal PASM mode. New, even lighter wheels in racing design with central locking and UHP (ultra-high performance) tyres now even featuring tyre pressure control round off the functional and visual enhancement of the GT3. With driving dynamics and performance increasing to an even higher level, the brake system, following an old Porsche tradition, has been enhanced accordingly on the new 911 GT3. The brake discs now come with an even larger friction disc and an aluminium cover to reduce weight even further. Further improvement of brake ventilation, in turn, guarantees an even higher level of consistent brake power also over long periods. And as an option the GT3 comes as before with an exclusive version of PCCB ceramic brakes made specifically for this model. Starting in autumn, the new GT3 will be available with yet another option making the car even more suitable for the race track: new and highly innovative PADM (Porsche Active Drivetrain Mount) engine bearings. These special engine mounts recognise a particularly sporting, race-like style of driving, making the normally elastic engine suspension hard and particularly resistant. This retains all the motoring comfort of the GT3 in everyday traffic, while on the race track the car is not affected by any mass forces coming from the engine, as would otherwise be the case in fast bends and on winding tracks. Yet a further advantage is the car’s improved traction when accelerating from a standstill. Another feature also new on the new model is the optional lift system for the front axle able to raise the ground clearance of the car for driving on bumpy surfaces or steep gradients – for example into an underground garage – at the touch of a button by 30 millimetres or almost 1.2”. The Euro base price of the new GT3 is Euro 98,100, in Germany the retail price including value-added tax and specific national features is Euro 116,947. 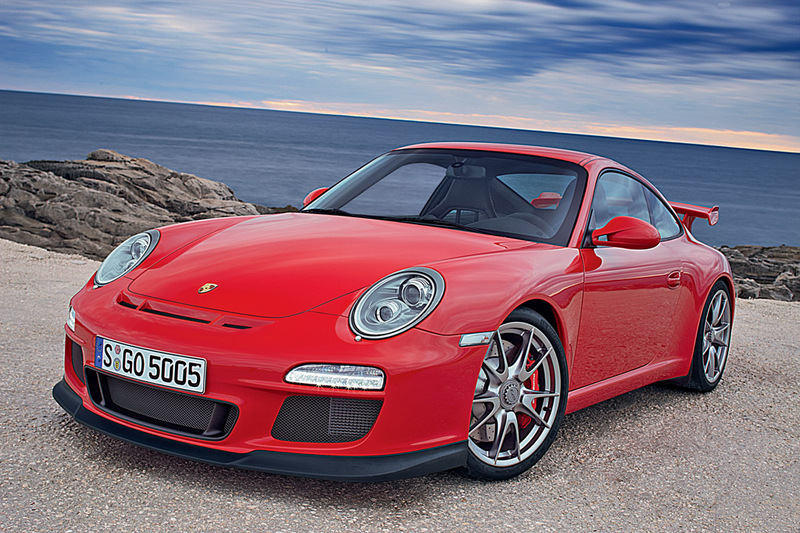 In the USA the GT3 will be at the dealership in October at a price of USD 112,200 (MSRP without taxes).